I was watching The Outlaw Josey Wales, one of the great westerns, for the umpteenth time the other day. One of the minor characters was a huckster going round from town to town selling his miracle elixir which he claimed did everything from cure any ailment to clean your clothes. 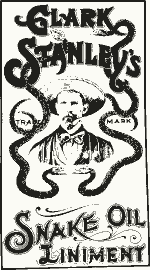 Snake oil salesmen they called them. Over the years, regulations came in about what you can and can’t say in advertising. These were designed to protect the consumer in various ways, with the most important rule being that you had to tell the truth. Of course, which aspect of the truth you chose to highlight and the way you chose to tell it was another matter. But funnily enough, even in the early days of consumer advertising, when the rules were few and far between, it was rare to find a downright dishonest claim for a product or service. The reason for this, if you think about it, is simple. The great majority of products rely on repeat purchases. You might fool someone once by claiming that what you were selling was faster, better, washed whiter or whatever, but if it failed to live up to your claim, the buyer would look elsewhere. They would often tell their friends to do the same. Come the 20th century and the days of mass communication and consumer marketing, you simply couldn’t get away with dishonesty. In fact the quickest way to see off a lousy product was to pretend it was a good one. Or, if you were Clint Eastwood, Mr Josey Wales himself, to spit tobacco juice on the salesman’s tailcoat and invite him to clean it with his own magic elixir. I’ve been lucky enough to work with some great products and brands over the years – to see some examples, please visit my copywriting for blue chip websites, my direct response writing and my press and posters pages. This entry was posted in Advertising copywriting and tagged honesty in advertising, outlaw josey wales, snake oil salesmen. Bookmark the permalink.